My name is Tariq Dar and I am the owner of Kashmir Heritage from India. For generations my family is producing pashmina's and shawls in Srinagar, in the north of India. We live and work in an area that is known as Kashmir; the place where the best quality wool is being produced. My whole family works in our company, which keeps me busy the entire week. 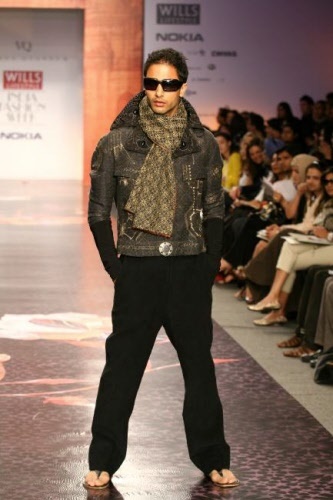 During weekends I like to walk the ramp as a model for different fashion houses. Somethimes it is possible to show my own shawls during a show. Our company produces different sorts of shawls; the comfortable viscose ones up to the most beautifull designed wool shawls. We also have a collection of antique shawls, please do send me an email if that is of your interest as they are not yet online. We export over the whole world and have decided to start selling online as well, to satisfy the many requests we received from customers all over the whole world. All the items which you see on the site are on stock and can be sent to you within a couple of days. Because we produce ourselves, we can manage the entire production process; from shaving the goats to the delivery at your doorstep. This is why we can guarantee you the best price for the best quality. In retail as well as in wholesale. Please, feel free to have a look at our website, and you can always contact me for any further questions.